jobs have led to substantial reductions in poverty. Rapid advances in technology have created new opportunities for jobs and economic growth, and the share of developing countries of the international trade has grown. 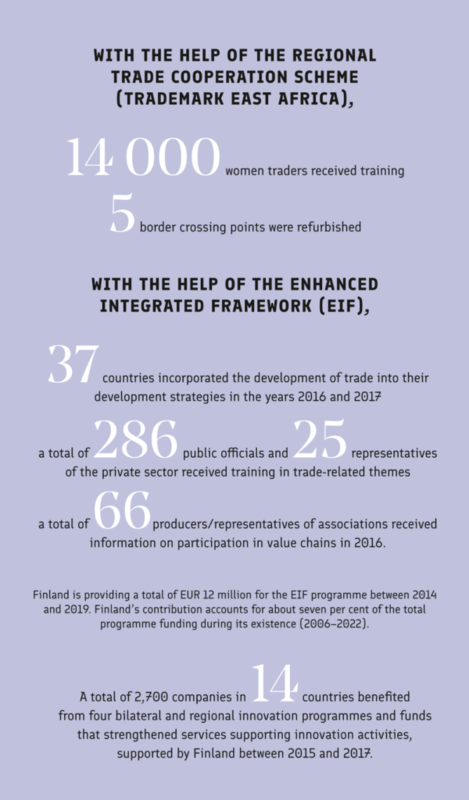 Finland has strengthened cooperation with the private sector and put emphasis on women’s employment. Decent work guarantees adequate income, is not life-threatening or harmful to health, respects the right to organise, is not discriminatory, and allows sufficient time for rest. Fairtrade Finland by providing them with training. Pay and working conditions in the cooperatives improved and job satisfaction jumped from 10 to 60 percent. vulnerable position have received vocational and entrepreneurship training. As a result, 60 per cent of them became self-employed or were employed in paid work. and a source of livelihood with the support of the Abilis Foundation. Many of them become small entrepreneurs. of whom are women) became eligible for social security in as many as between 80,000 and 120,000 women received the right to sickness and maternity leave and pension. 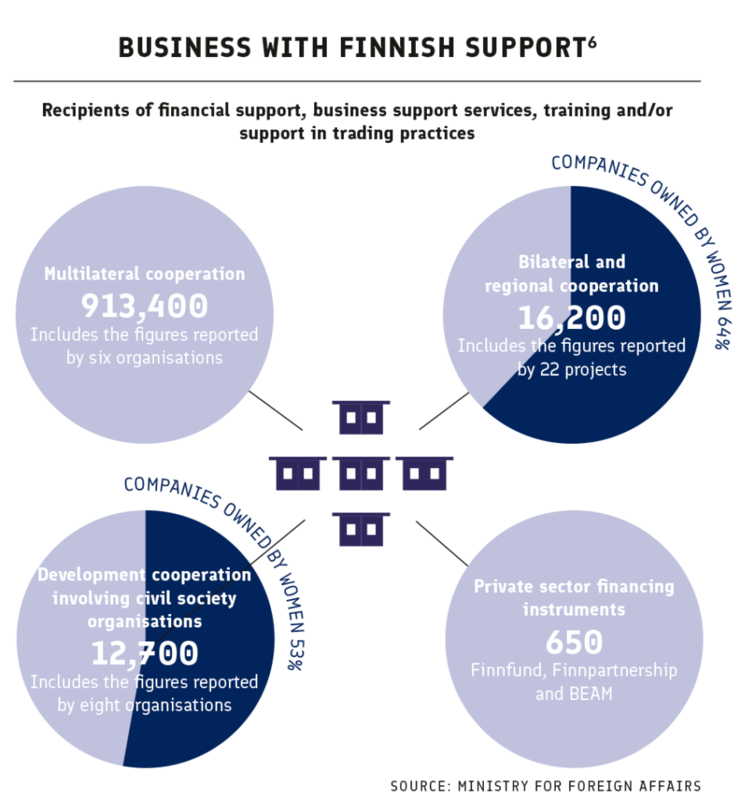 foreign trade practices with Finnish assistance in a supported UNDP programme. Between 2015 and 2017, nearly 7,000 entrepreneurs received support for trading practices or training enabling them to boost production and make value chains more efficient. Public officials were provided with training in foreign trade practices and in the lowering of trade barriers. export contracts with European, Asian and Russian customers. The value of the contracts totalled about USD 400 million. There has been demand for clothing, nuts, milk products and dried fruit. The project has created nearly 800 new jobs. A mobile application for monitoring market prices of agricultural products was developed in Tajikistan. It has more than 200,000 users. innovation activities with the support granted from IPP. About 100 people in managerial positions in public administration and universities have received training in innovation management and funding. The 18 companies supported by an accelerator programme for growth enterprises have created almost 700 new jobs. The companies have expanded their operations to the US, EU and Asian markets. and innovation cooperation between Vietnam and Finland. presence in the Vietnamese market. the 2030 Agenda for Sustainable Development. Economy and jobs -priority contributes especially to the goals number 8, 9 and 12.